The final Zed - another Big Boss Zombie, and another ugly one! This could have been finished at the weekend, except for my sojourn with Rob to some VBCW gaming in Evesham (read about here on Rob's blog). So the last bits and bobs of painting were completed over the past two nights. In all I hit the minimum target which is pleasing. Considering I had painted so little in the last few months I suppose I should be satisfied with doing even just 5 minis. This Boss Zombie is from the same pack as the last one and is by Studio Miniatures. Base as usual is by Fenris Games to tie my horde together. A nasty looking piece of work this one, I wanted the 'cracked skin' on the hands to have the hint of red-raw muscle underneath. Okay, my offering for Week 3, and the fourth of the target minimum of five. 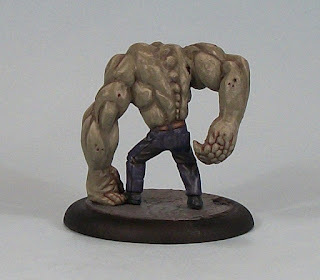 A big Zombie (or a boss as I like to think of the Zeds I mount on 40 mm bases). That means my current 'horde' stands at 19 minis, and if I hit the Zomtober target it will mean a twenty five per cent increase since last year. I love the irony of this mini - a fat Zed in sweats! I feel my painting rustiness has subsided, so this is probably the most satisfying of the minis painted so far this month, and the nice big surfaces probably helped in that. The skin toe is my usual Zed-recipe of Vallejo Green-Grey base, with highlights of a Green-Grey plus Basic Skin Tone mix at 2:1, 1:1, and finally 1:2 ratios, with some very thin Devlan Mud as a wash. The mini is a from a pack by Studio Miniatures, with the usual (for me) base choice from Fenris Games. I have some more Zombies in various stages of completion, so I think I should hit the Zomtober target; just one more to go to hit the target, anything else is a bonus. Rob, inevitably, has painted about twice as many as I have! Zomtober rolls onward. Don't forget these other fine blogs engaging in the Zomtober madness. 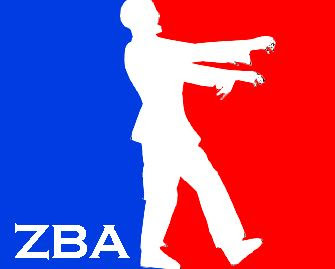 If you want to add your blog to the list, just comment - it is never too late for Zombies! Okay two more done, not brilliant by any means, but done. I consider these to be my Week 2 and Bonus Zombies, meaning I just need to complete a minimum of one per week for the next two weeks to stay on track. The Zombie on the right is Hasslefree (sculpted by Matt Lord rather tan Kev White); I am clueless as to the origin of the other one. I think I now the problems I had with these, and I think it relates to by current 'black' technique and the drapery on these minis. I was not overly impressed with the way the drapery has been sculpted, and consequently I struggled with painting it, it probably does not suit the technique I tried. They should be fine amid the horde however, so no great problem. Bases are the usual Fenris. The bottom picture shows these Zeds with the first one as a group of three. Most of my Zombies have been painted in groups of three so far, each tied together by a colour theme. Remember these from a few posts ago? 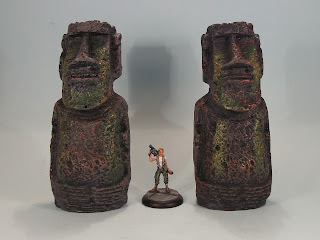 Here they are with Mysterious Man (from Pulp City) for scale. Well they were sprayed grey, had a few different shades of grey daubed on top, then a couple of lighter greys dry-brushed over that. Simples. Add a couple of washes (Secret Weapon Black-Green wash thinned with water and and Army Painter Dark Tone again thinned down heavily). Not the most amazing painting ever, but they are now as I want them. Readers may recall that Rob threw down a challenge to paint five Zombies this month (which we renamed Zomtober in deference to the undertaking), and today I have been busily working on three, of which this is the first completed. the others are not quite done, but they get me 'ahead' as it were for next week and maybe the week after. 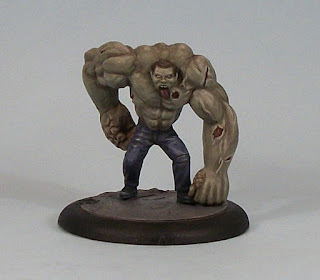 This Zombie is from Studio Miniatures. My painting is certainly a bit rusty since I have been so out of practice, but at least I hit the first deadline. 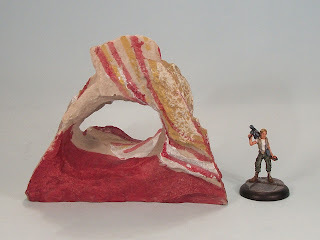 The base is Fenris Games which I tend to use for most of my Zeds. Rob has already completed two Zeds, but he paints faster than me so that is to be expected. Onwards then with Zomtober, and if you want to join in please comment and label your own blog posts/threads Zomtober and I will give you a plug on the Eclectic Gentleman Tabletop Gamer. 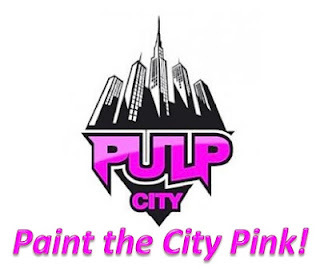 I mentioned this fund-raiser on Pulp Citizen, but it is well worth highlighting again. Hendybadger (of Tales of a Tabletop Skirmisher) has launched a fund-raising project in aid of Cancer Research UK. The premise is simple and details can be found in the Tales of a Tabletop Skirmisher post here. More and more prizes have been added to the mix from all sorts of great manufacturers. Hendybadger wants as many participants as possible as there are tons of prizes available (see this post here); so grab a mini, paint it pink and enter into this great fund-raiser. The statues of Resurrection Island? I picked these up in a buy two get the (cheapest) third free offer at Pets At Home. The three items came to less than £9 GBP, and are items for aquariums/aquaria. They come with a couple of holes (for retail tags to feed through) which needed filling and so since they have needed a little green-stuffing, I will be repainting them. They are pictured with June Summers (Pulp City) to show scale. The Easter Island heads (maybe Resurrection Island could be a 'location' in the southeastern Pacific Ocean?) will be painted a basic stone grey. I can see these used on Kodo Island (Pulp City), as well as for Pulp or Victoriana gaming, or maybe even sci-fi on some back-water planet. The rock formation interested me for the cover possibilities& with the aperture. That will be painted to match the Ziterdes Modular Gaming Table boards I picked up a couple of months ago. It will not be staying that colour, trust me! Expect more pictures when they are painted. Not only has me mate Rob, the brains (...brains, brain...) behind Zomtober started us both off, but Brummie has decided to join in, as has Adam. Therefore until the end of the Zomtober period I will post an updated Blog-roll for Zomtober participants. . . . . Further away and up the hills. . .
28mm Monstroid in the Palace! Some things I have been working on. Revolutionary 3D Printer Promises To Develop An Entire Property In A Day! Zomtober 2018 - Zomtober VII! !